As UN humanitarian chief Valarie Amos heads to Syria, Geneva-based UN human rights envoy Danny Al-Baaj announced he would abandon Assad. As United Nations humanitarian chief Valarie Amos heads to Syria and Lebanon, Syria's Geneva-based U.N. human rights envoy Danny Al-Baaj announced he was defecting to the opposition. Amos is expected to seek ways to increase emergency aid to civilians in the civil war-torn country, according to a United Nations spokesperson. More than 100,000 Syrians have fled across the borders to surrounding neighbors, seeking refuge from the bloody clashes between government troops and rebel forces. 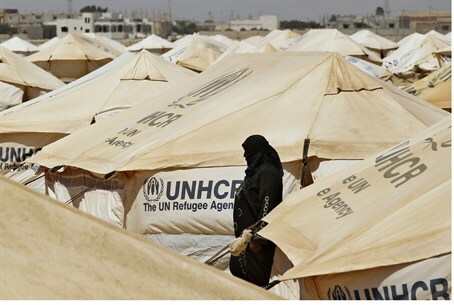 At least half of those are living in the Al Zaatri refugee camp in the Jordanian city of Mafraq, near the Hashemite Kingdom's border with Syria. Meanwhile, on Monday, Al-Baaj, the third secretary in the Syrian delegation to the United Nations Human Rights Council and its highest diplomat in the group to defect, announced to reporters that he felt he could no longer do anything more for his nation. "I announced my resignation on Friday on a Syrian web site and informed the Syrian charge d'affaires in Geneva," he was quoted as saying by the Swiss news agency ATS. "I was in contact with an opposition group for some time. The situation continues to worsen. I felt that I could no longer serve my country in the government camp," he said. "I met with Syria's (Geneva-based) charges d'affaires to let him know that I had made my decision to go to the opposition... He said it was my choice and wished me luck,” Al-Baaj said. He added that his parents are with him in Geneva. The envoy is his country's first diplomat to escape the regime in Switzerland, although he told reporters he had been in contact with the Democratic Forum opposition group in Paris. Others have abandoned President Bashar al-Assad by defecting to Qatar, Jordan and other Arab nations.